I'm a recent subscriber to Topbox, but I was pleased as punch to see that the first Limited Edition Topbox that came up during my recent subscription was a very useful mani/pedi kit from Sally Hansen and Flare! For $28 this box had over $50 of products in it, featuring some of the latest tools of the Sally Hansen nail line, and a variety of on-trend colours that will easily lead me from spring to summer. Tag along and see what I got! Boom! This box actually came packaged with this month's slightly disappointing monthly Topbox from Murale, so thankfully it cheered me up! I knew exactly what I was getting in this box but it was nice to see something so spring-like after such a dreary winter! Even though I knew in advance the colours I was getting, it was nice to see the difference in person. I thought that Jaded would be more of a mint colour but I'm happy to report that it definitely is more of a jade or cut class colour, and Strawberry Shields is going to become one of my go-to glitter topcoats this summer. The Sally Hansen Compete Salon Manicure formula aims to be a basecoat, colour and topcoat all rolled into one. But since I have been suffering from brittle nails all winter, I still used my hydrating base coat and Sally Hansen Insta-Dri topcoat to preserve the mani for about a week. I'll be sure to give the claims a try on my next mani. And while it's still not warm enough to expose my toes, but I think the cheery watermelon shade of Get Juiced will be a perfect pedi colour come sandal season. Everyday Cait has some great swatches if you're looking for some more detail about the polishes. But this time? I'm a convert! 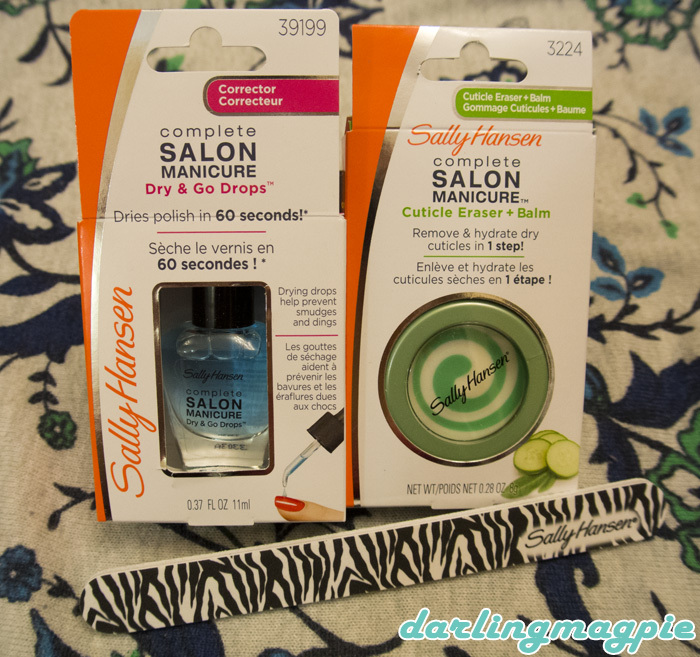 The Sally Hansen Dry & Go Drops come with a little dropper and you simply put a drop on your nail (I do it on the nail bed with my hands angling down) and NOT ONLY does it dry faster, the consistency of your nail feels SO SMOOTH. I loved it. Sadly, the Cuticle Eraser Balm was a disappointment. It felt greasy, not moisturizing, and the nail file was just a nail file. One of the best surprises of this package was how gorgeous the So Susan 8 Hour Cheek Stain turned out to be! It's a fairly large tint so it's not easy to take on the go, but it may just turn into my go-to gel blush this summer. It blends rather easily and provides a cheery tint to the face and isn't drying on the skin. So, all in all, I'm extremely impressed with this bonus box! It came with a 12-month Flare Magazine subscription that I asked to have refunded, so when the refund comes though my total spending for this box is less than $20 for all these fine products! You can still buy this box (no So Susan unfortunately) for $25 from Topbox. Topbox has another special box right now with Lou Lou magazine. I already have a few of the items featured but it's a great set to keep you beautiful all summer. Give it a look.